I was shaken in ways I had not expected by the hearings in the U.S. last week. I was filled with rage. I wept. I shouted at the computer. And I was very surprised. I didn’t even plan to watch. I’m surprised because I’ve traditionally been good at compartmentalizing, good at being able to get on with the work of helping women share their voices, of doing my own writing, of taking care of myself no matter what. I have always refused to be overtaken by events I cannot control. If a disaster happens, natural or political, I call my reps, I give money to a reputable organization, I send love and care in my meditation, and I focus on what I can do: love my people, do good work, keep my mind and heart steady. But I find this increasingly difficult to do. Not just because of the reality show politics in the U.S. and other countries but because of climate change and the opioid crisis and the slew of complex problems we are faced with as a species that we can’t even get out of our own greedy ways to work on! I thought my anger was because I was taking in too much news, but I cut way back and started a weekly news fast. And still, I am bruised. Frayed. Angry. I don’t want to hide behind my outrage and anger. Anger is a blunt force weapon not a subtle tool of negotiation or mutual understanding. But I don’t want to hide from it, do a spiritual bypass, rush to fix it. I LOVE to fix things. My generally optimistic nature wants to do something. But fixing feels too narrow or soon of a response now, too much like turning away from the white heat that needs to be felt. Only it’s so hard for me to feel angry. I get in the way, try to make sense of it, try to coach myself out of it, tell myself it’s someone not okay. Not safe. Even writing this makes me nervous. I think of you reading it and wonder if you will find me psychologically lacking or spiritually unevolved. I’m working on allowing myself to feel what arises, to allow space… and to bear it. It feels subtle and raw, very private and yet, clearly, public. It feels remedial and essential. A different way to grow my heart because anger is as universal an emotion as love. We all feel it. Perhaps feeling mine more freely will help me understand the people in my life and the people who think differently than me a little more. Beautifully said. And you speak for many of us. Thank you for writing this post in a manner that does not promote a particular view or political agenda and in a manner that does not denigrate those with whom you disagree. I have unsubscribed to a number of blogs (blogs not about politics) this week that that have used their forum to club their readers over the head with their viewpoint while viciously attacking those with opposite views. I don’t read a blog about writing to hear the bloggers political views–and I don’t care what those views are. In fact, in this case, I’d prefer not to know and welcome any place these days that provides a respite and relief from the endless and toxic political environment in which we live. There is plenty of justifiable anger on all sides and ample and appropriate places to express those views. I would guess that my views are different than yours but will continue to subscribe because while you feel frayed and angry, as do I, I believe that you wrote this post in a sensitive manner that speaks to people on both sides of this ugly divide. Totally appropriate to feel anger, to acknowledge it, and to know that it tells me who I am. It will propel me to do the right thing at the right time, and I will know it when I’m ready. But also, it is appropriate to feel fear, which is the origin of the anger. And I am afraid. I am afraid of people–people who defend men like Kavanaugh and Trump and want to erase women like Dr. Ford. That’s what scares me more than anything–knowing that there are people who actually are convinced that she is lying, part of an evil conspiracy trying to prevent a good man from achieving that to which he is entitled–a position of power that will enable our courts to deny women our civil rights, our human rights, and the same freedom and stature belonging to men no matter what they say or what they do. And I am sick and tired of it. I am weary of it. Weary of knowing it–and that it has been going on for thousands of years– and of fighting it every time I turn a corner. In 2018 on this precious planet earth, should we yet feel this level of despair? There aren’t many female role models that show us how to be angry, and channel our anger so it’s productive, not destructive. I like Thich Nhat Hanh’s advice of inviting your anger in for tea, but…in the heat of the moment, that doesn’t work for me. 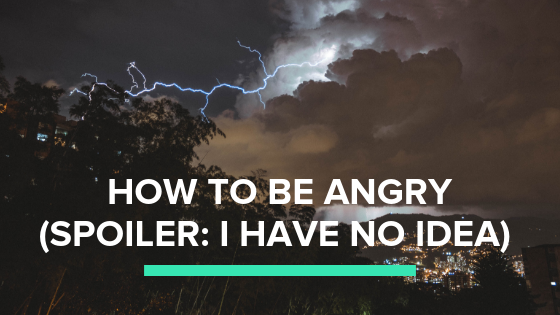 I’m interested in exploring what’s underneath the anger—for me, it’s usually fear. Thank you for sharing this Jennifer! I agree with Michele, I feel afraid. I tried circulating an article, Trump, Women and the Road to Oppression: http://www.thriveglobal.com/stories/45263-trump-women-and-the-road-to-oppression, but got no traction with the 20 editors I submitted it to or even views where it’s posted. It’s like people just want to ignore this because they feel powerless, but that’s exactly why we need to reclaim our power. Women need grassroots leaders who can mobilize them to do things like campaign in Maine and Alaska – even writing letters to the editors there letting their leaders know what we expect of them. Instead it’s like we went down without a fight. Really odd. I submitted my comment on 10/3, just as the ones that are shown above. Yet mine still says “awaiting moderation”. Why is that? Because I have a different opinion? Very odd—or perhaps not. Ooops, these got caught in a spam filter and we didn’t see them until now. Thank you so much for sharing this. I feel this anger, too. I think we are a lot out there! Thank you all for these fine and wise comments!